(Nanowerk Spotlight) Rice husks – the outer, protective covering of rice kernels, which makes up more than 20 wt% of the entire kernel – are the by-product of rice milling. Given the sheer volume of this agricultural waste, roughly 120 million tons a year, researchers have been exploring ways to utilize this silica-rich biomass for the synthesis of valuable materials. In previous Nanowerk Spotlights we already have reported on two successful strategies by nanotechnology researchers to recycle rice husks to synthesize graphene and to produce nanoporous silicon for high-capacity lithium battery anodes. "Due to the high concentration of silica in rice husks, most of the present research focuses on the preparation of silicon-based materials, which exhibit broad applications in the fields of adsorption, catalysis, energy storage, etc.," Dr. Luyi Sun, an Associate Professor in the Institute of Materials Science at the University of Connecticut, explains to Nanowerk. "It is worth pointing out that there is also a large amount of organic components (ca. 72-85 wt%) in rice husks, which is typically wasted in the preparation of these silica materials." In their latest work, Sun and co-workers developed an advanced method for the comprehensive use of rice husks. 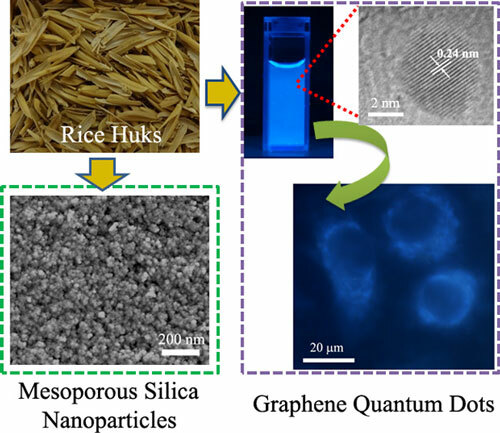 They fabricated high quality graphene quantum dots (GQDs) from the organic components of rice husks, and simultaneously obtained mesoporous silica nanoparticles with a high surface area from the inorganic content. The team reported their findings on Dec. 28, 2015 in the online edition of ACS Applied Materials & Interfaces ("Large Scale and Controllable Synthesis of Graphene Quantum Dots from Rice Husk Biomass: A Comprehensive Utilization Strategy"). This work was a collaborative effort with Dr. Xin Zhang at Guangdong University of Technology, Dr. Bin Liu's group and Dr. Yuhua Wang’s group at Lanzhou University, Dr. Weixing Wang at South China University of Technology, as well as Dr. Steven L. Suib’s group at the University of Connecticut. As Sun notes, the preparation of graphene quantum dots usually adopts either a bottom-up or a top-down method. In their work, the team developed a new approach that combines the advantages of both of the two methods. "This is the key to utilizing rice husks as the raw material to obtain high quality GQDs," says Sun. "In addition to fabricating GQDs with a high yield, we simultaneously synthesized valuable mesoporous silica nanoparticles from the inorganic component of rice husks. So, this work realizes a truly comprehensive utilization of rice husk biomass." The team's as-prepared GQDs from rice husks can emit bright blue light when irradiated by an ultraviolet lamp. They also show some unique photoluminescent behaviors. "We investigated the photoluminescent properties of our rice husk derived GQDs (RH-GQDs) to explore their further use," says Dr. Zhaofeng Wang, the first author of this work. "We found that the emissions of the GQDs are strongly dependent on the surrounding temperature, excitation wavelength, as well as the lateral size. These unique features provide us many opportunities to further adjust the emissions of RH-GQDs for various uses." He adds that the team has confirmed the bio-activities of the RH-GQDs. Therefore, the researchers expect that the RH-GQDs will be very suitable for biomedical applications, such as bio-imaging and bio-probes.